April has become a month of memory even if we don’t often talk about it that way. In April, we remember the Autistic community’s conflict with Autism Speaks. Four years ago, that struggle was all-consuming. It was impossible not to take a side. For people on the side I chose, neurodiversity, hope for Autistic people as we are, hope for a vibrant, diverse humanity, it was hard to go a day without thinking about what felt like an existential threat. Every day that went by was another day of cure research, another day when resources devoted to cure research weren’t used to show the world what we knew: that an Autistic life could be a worthwhile one. Living under that oppressive sense that we were running out of time, that someone was always trying to wipe us out, wore people down. What we did about it wore people down. Exhaustion and bitterness accumulated in activists so fast that it grew visibly from week to week, sometimes day to day. Every April, we remember that time by talking about it and, in some ways, reliving it. The problems with Autism Speaks become the kind of everyday blog post topic they were year-round in the past. Autistic activists celebrate how far we’ve come in making eugenics less socially acceptable to a limited extent. We talk some about how exciting it is that we’ve gotten our leaders a seat at the table in important discussions of policy and culture, but we talk about Autism Speaks more. We focus on this organization even though it’s increasingly struggling to hold onto funding, come up with a strong mission, and stay relevant. I’ve said before that Autism Speaks has backed itself into a corner. Increasingly, its options are to alienate its strongest supporters by getting less ableist or get left behind as everyone else moves forward. Another writer in this publication recently acknowledged that Autism Speaks isn’t our biggest problem. It hasn’t been for a while. In April, we remember and celebrate our opposition to Autism Speaks with traditions of our own. We have our competing alternative colors, our memes about not donating and not lighting it up blue, and the regularly-scheduled Facebook and Twitter skirmishes. It’s starting to take on a festive atmosphere, and that isn’t a bad thing. That opposition is an epic story of very young people starting organizations from nothing and actually getting them off the ground, of what college and high school kids, working mothers, and other misfits with no money and little relevant experience did when their backs were to the wall. Those things are worth celebrating, but the way we do it, where we put our focus as we remember, could be more productive. Spending a month rehashing struggles that are starting to look more like historical reenactment than cutting-edge activism may not be the best use of our time. With so much happening around our community that could affect us, we can’t just look back. We have to look forward, too. April can be a time of productive memory, too. Instead of just remembering the wins, we need to remember what we did because the way we addressed Autism Speaks might help us solve other problems. We can remember what we can accomplish when we show up for things by the hundreds or thousands, how undermining the funding of things we don’t like does more to stop them than dramatic gestures, how our activism and community work best when all kinds of people feel welcome, and how important it is to be kind to each other when we do hard things together. If you don’t remember those lessons personally, ask someone who does. There aren’t as many of us left as I wish there were because some of us got too worn down. Some of us are gone, but those of us who are still here are happy to talk about what happened. Remembering is healthy and human. Without some shared memory, there is no community, but we’re facing a time of unprecedented change and threats again. We need to make sure we’re remembering in ways that will move us forward. Thank you. 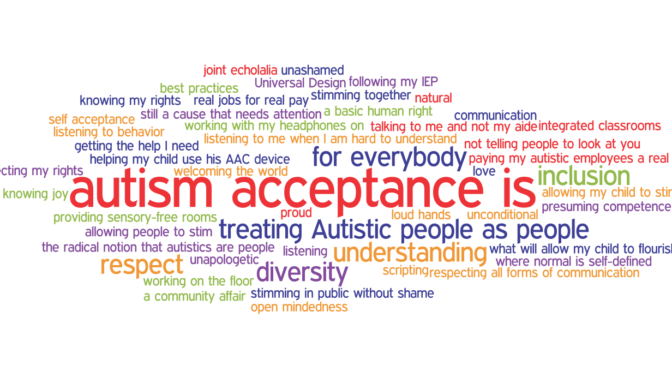 We are stronger together, and we as activists need to respect our fellow Autistics. I really despise infighting within our community and feel that it would be much more beneficial for us to look forward and not back. We don’t need to rehash old battles publicly that we’re winning anyway. The war here should be against ableism. Now if only I could stop holding grudges against people who have wronged me personally and won’t admit it.